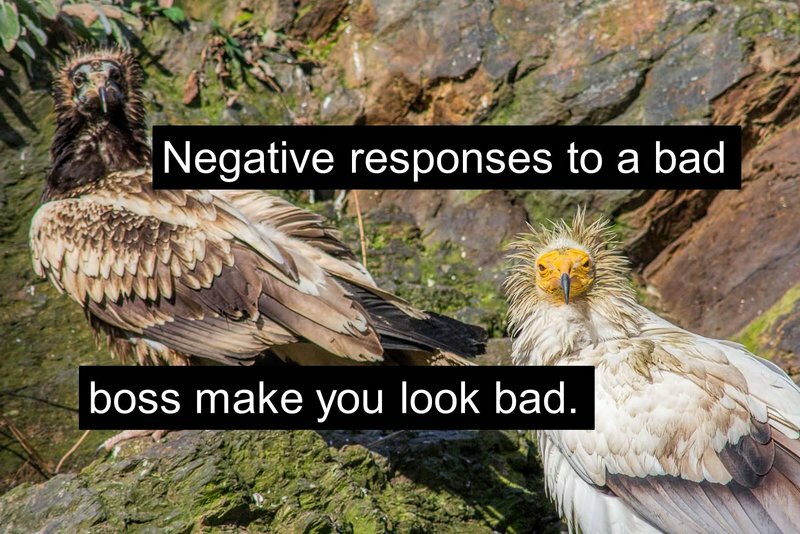 Negative responses to a bad boss hurt you more than it hurts them. Do you really want to give your power to someone you don’t like? I recently had a coaching session with a successful manager who has a lousy boss. Toward the end of our conversation I gave them this feedback. Your best self comes out when you talk about work, projects, and vision. But, when you talk about your bad boss, your worst self comes out. Which self do you want others to see? Solving a bad boss situation may result in you leaving your company. But, in the process, don’t let a bad boss make you look bad. Your boss’s boss probably won’t solve this issue for you. Spend more time seeking solutions than pointing out troubles. Figure out what your bad boss wants and bury them with it. Do they want information? Give it. Focus on things you love about work. For every complaint give three expressions of gratitude. Take a lateral move within your organization. Vent to someone you can trust. Focus on things you can control. Bonus: Let a bad boss bring out your best. Sympathy destroys you. Sympathy validates self-destructive attitudes and justifies negative behaviors. You don’t need sympathy. You need a kick in the pants. Stop letting someone you don’t like limit your career. I asked Facebook fans to fill in: “Bad bosses _______.” Check it out and contribute here. What are some suggestions for dealing with a bad boss? Well in AA the Big Book, the greater manual for living ever penned, if you recognize how to read it says, resentment is our number one offender. Bad Bosses only exist in ones mind. Change the way you see others they are different. See folks behaving badly as suffering soul sickness and respond with compassion. Resensing what we do not like just shoes us more examples of what we don’t like!! I AM determined today to see Epic Oxytocin Machines everywhere I look!!!! I seek, I will find!! Remember Little Big Man! The tribe being slaughtered by the white eyes!! Grandfather dreamed the night before the soldiers could not see him??? He told Little Big Man and they walked right past the solders to the safety of the river!!! What you see is what you get!!!!! You decide what you see!!! Lots of response-ability required!!! 100% in fact!!! The only way to freedom of the mind because once you decide you choose to see, pause, respond. Cool post Dan!! Title really catchy!! Thing is nobody makes me anything!! I am making it all up as I perceive along, just like everybody else with this amazing 3 pounds of incredible-ness between my ears!!! Most incredible machine ever built and 7 billion other amazing copies perceiving around!! Thanks Scott. Your mention of resentment is right on. Resentment is behind self-destructive responses. Great add. Powerful stuff Dan. I try not to let others make me … angry, resentful, jealous, etc. because as you said, do I really want to give power to someone I don’t like? Knowledge that I can control myself, even in bad situations, and not let others control my response, is uplifting and freeing. Thanks Duane. I’ve had a bad boss and I bet most Leadership Freak readers have too… It AIN’T easy. As you indicate, keeping control of our emotions and focused on positive results is tough. Glad you dropped in. You need to keep in mind that one of your main priorities should be to please your boss – and that if you can’t do that with integrity, you need to move on. Thanks Bill. It’s pretty hard to make a great contribution and get ahead when we AREN’T pleasing our boss. It’s sad that great people have to leave an organization because of a lousy boss. But, sometimes that’s all you can do. sometimes it’s difficult to classify a boss – ie Steve Jobs – a good boss for leading innovative teams – a bad boss for being a bully who humiliated people who disapointed him. Sometimes it’s our tolerance that determines. Thank you for the observations about what you can decide to do and how you want to be when working with a boss. When you focus on what you want, what you have, what is possible, what you wish to create, what you can do, what is your compelling purpose driving you forward, what you wish to achieve, who you want to serve and what you have accomplished, there is little time to let negative boss behavior drag you down. And even better, those around you will sometimes catch your focus and join you in focusing on the assets in the situation vs. the deficits. Thanks for empowering leaders to become even better than they are! Thanks Cindy. That second paragraph is a goldmine! I find that focusing on Who I want to be and thinking about How I want to be perceived very helpful. … could really use your help. See what you can do to help the “bad boss” get better. You both wil benefit. Thanks Karin. I love it when your compassion comes out! Kapow!! Wow Dan, again a great bit of insight here (in less than 300 words no less, haha). Truthfully, this is something I’m dealing with now. I think it is important to realize that bad bosses are typically good people, and they typically don’t wish bad on you. It may also be that they are the boss everyone else needs, but it doesn’t work for you. I believe that is the situation I’m dealing with now. For several months, I was angry, frustrated, and depressed about it, because I didn’t really want to leave, but I also didn’t do anything about it. However, I am now at a point of peace because I got the kick in the pants I needed to stand up and do something about it. It might very well mean I leave sooner than I had wanted to, but knowing I’m doing something about it gives me hope, and I’ve also noticed I’m doing better work. I think it is important that we all understand that sometimes tough decisions have to be made, but if we stop and take time to make the right decision instead of letting it destroy us internally, it will almost always work out better in the end, and you’ll be happier for it. The worst thing that could happen is if you allow it to eat you up on the inside, have your work and relationships deteriorate, and get fired for it. You will leave in disbelief, anger, and bitterness, and likely with no fall-back plan. Thanks John. It’s a pleasure to see that you are rising up. You got me thinking about how “bad” bosses help us grow. I think I’ll write about that tomorrow. Best wishes for the journey. Once you spend some time being a boss, you gain a lot of perspective. I have apologized to several “bad bosses” from my past because I understand now the pressures they faced. I feel really lucky to have a great boss today. No complaints here! Thanks dunk! So true. Successfully navigating a bad boss includes walking in their shoes. This is so true. If my 18 months with a bad boss taught me anything, it was how toxic I could become. It also moved my loyalty from a person to our organization and mission. Ultimately this was a good thing, and once I made that shift I could move from being paralyzed by my anger to doing what I could do to stay on mission. That is the best advice I can give anyone in that situation – connect with the mission, do what you can. But if you can’t outlast your boss (like I did) it may not be enough. Originally, the first point on the list was 1. Always seek the best interest of the organization. .. I deleted it because, when we are angry, we might get fixated on getting rid of the bad boss for the “good” of the organization. I didn’t want to go down that path. An interesting & useful post! It’s difficult to point out shortcomings of a bad boss. The boss’s boss will never believe you. Even if you the necessary facts to prove the point, your image goes down as a trouble-shooter. The best thing is to go with a practical approach and point out the constraints/problems more as limitations and without naming the boss raise the issues. Also, suggest the possible solutions. The hard fact is most times you aren’t heard and you may have to go with a compromised way if you have to continue in the same environment. Opting out could be the best solution if you loose your own self-respect in the process. It’s difficult to change people particularly the higher ups! Thanks Dr. Asher. “The boss will never believe you.” … So true. Which is why, trying to change the boss is often a losing proposition. Have a great weekend. Even still, most people have at least SOME dysfunction (grins) so it really isn’t something any of us can realistically steer clear of. So as you are suggesting, we have to learn to deal with these sort of dynamics as a part of life. Personally, if/when it gets tot he point that someone is so negatively impacted by their bosses behaviors and CANNOT stop talking about him/her to others…it’s a sign it’s time #1) DO something about it…as in, be brave enough to have a courageous conversation with your boss and at least talk about what you think/feel…important…you have to OWN your feelings. Be responsible for them. And #2) If it’s that bad, takes steps to either leave and/or find a new job. The only people who really CAN’T do something about it are prisoners and slaves. Granted, some may REALLY need to find additional support before making big decisions, money may need to be saved, etc. ‘Your best self comes out when you talk about work, projects, and vision. But, when you talk about your bad boss, your worst self comes out. I’m sure most of us who has EVER had to deal with a bad boss (either gender) needs to be reminded of this on a regular basis when things start building up with a bad boss. When we get to that point, the conversation is mostly rooted in feeling powerless. Still at the point where ‘we’ don’t yet know what to do. Feeling injustice over whatever is occurring. Don’t WANT to have to be the one to uproot and leave, etc. In my experience, most people regardless of being a leader or not, has poor communication skills, has a difficulty time not only taking responsibility for what one thinks and feels, but also has a difficult time being honest about those thoughts and feelings. Hence, all the passive aggressive bashing sessions. Until a person is willing to take responsibility for their own thoughts and feelings, recognize that it may not be fair, they DO have the power to either speak up directly and/or find another job, people will remain feeling powerless. Granted, the above is nutshell and is not meant to necessarily meet the need of any and every possible circumstance under the sun. There ARE some monsters out there. Hey Blue Eyes…how about what is behind door número tres?????? Look at the person differently as sick, not a jerk? Also Trevor Blake wrote 3 Simple Steps! I am SO excited going to take a class he is teaching starting April 30th!!! Anyways he says we can create a mental barrier up against stuff outside so as not to bother and distract us. I have just found in almost 30 years of recovery when I change my view….the story in my head changes. Ok if I quit and go find a new job Sammantha, who is the newest employee I meet at the new job??? The one who looks back when I am standing in front of any mirror!!! Anyways you not heard of Trevor….he is great! As for your use of the words ‘sick’ and ‘jerk’. I’d ask you to go back and reread my comment. Perhaps you will see that I did not use either of those terms anywhere in my comment. You did in yours. So please be careful of projecting your own thoughts into other people’s comments. Because that isn’t what I said anywhere in my post. Otherwise, thanks for the reply and I’m glad you are looking forward to your class! The point is you gave two options. Neither had to do with just changing ones perspective. Had to do with trying to have a logical conversation with an illogical person. Second tucking tail and running. At some point true change involves changing ones thinking. Common thread looking outside to solve an inner problem. The problem is not out there somewhere. I just am saying it might not be a bad place to just start there, it is the only place effective change happens. Great youtube video on youtube with I think Kelsey Grammars girlfriend and Trevor. He came to the US with 74 dollars. Built one company and sold it for 100 million dollars. Built second one and sold for 300 million. And the proceeds from his book go to cancer research charities. I admire people who DO and have DONE not blow hard theorists who pontificate on what others accomplish. Results not blow hard never done anything themselves theorists! Trevor whatever he says delivered results in his life. Samantha think you will really like Trevor, very down to earth guy. I’m still not sure how you managed to perceive sick and jerk out of what I originally shared, so that’s why I’m not able to follow your train of thought very well. Example: Since you have brought up perspectives, pontificating theories, and results…I speak from personal experience. Not theories. There’s an old ‘story’ that is not just a story to me because I’ve lived it but I’ll use the story instead. Can’t remember it verbatim but it had to do with a woman who came upon a monk living in a cave. It’s been so long since I read the story so I can’t recall what she initially asked the monk. It might have had something to do with wanting to becoming wise or something like that. So the monk told her to sit down and read a book he had. (again, can’t recall the book) As she was reading, the monk then came up to her and whacked her on the head with his staff. Of course, she cried out OWW! That hurts! The monk told her to keep reading and eventually she would become ‘wise’. A while later the monk came up to her and popped on the top of her head with his staff again. Once again, she cried out because it hurt. He told her to keep reading, etc. Eventually, the next time the monk tried to hit over the head with a stick, she put her hand out and stopped him. And that is basically the premise and foundation of what I was sharing in my original comment. It’s not about semantics. It’s not about referring or even THINKING another person is sick or a jerk or WHATEVER. If someone is hitting you over the head with a stick literally or metaphorically..you can love yourself enough to GET OUT OF THE WAY. We can change our perspective internally all we want… but if a person is being ABUSED at all…standing there and taking it isn’t exactly the ‘smart’ option. Unless you enjoy that sort of thing. Thanks Samantha. As I read your comment I got to thinking about the times that my responses to people in authority hurt me. I can tell you that I was the ONLY one being hurt. Although most of us have been out of school for awhile, the SAME thing still happens in the work place and beyond. I don’t mean to make excuses for ANY persons bad behaviors. However, when it comes to ONE ‘boss’ or CEO, supervisor, etc of X # of employees…there is more then likely going to be a ton of personalizing going on with the employees. And vice versa. Most of the time, we aren’t even on the radar! In order to please others you have to please yourself! If you are not happy how does one expect the Boss to be happy and visa, versa. The “Boss” is the “Boss” whether we like it our not. If you have issue’s with the “Boss” sit down and discuss your issue by communicating, with them often times conflicts can resolved, if they don’t know you, they can’t fix it. If you tried to discuss and have gone no were you will need to makes the choices that is best for you! If you can’t communicate you become the wall, speak your peace and move on. As someone who is ‘living this’ at this very moment, this was powerful and profound. I always talk about being self reflective and this was a moment when I had to take my own advice. I love having a mirror held up in front me. Thanks for the tips and tools. What are some suggestions for dealing with a bad boss? Be conscious of your communication methods. Emails are great because it better for some people to write out their thoughts while at the same time emails can be taken out of context very easily. Also consider body language for personal discussions. It’s like this article was written for me, Dan! Love all of it, and love the part about sympathy and it being validating of destructive thinking, and how you shouldn’t need it. Very, very useful advice. Like the others on here, I too had a terrible boss. Unfortunately all of the above was learned the hard way for me. In the end for the better though, thank goodness. It could have gone the other way! While you say focusing on the mission is important – concentrating on all those parts of your company’s vision that are the way forward is important and takes away from caring about your bad boss – I still say though that it’s possible for this to be impossible. I was in a situation where the “vision” and “mission” meant completely different things to me, my boss and also my bosses boss. There was huge misunderstanding, and my boss had absolutely no idea who to her job properly. This just made it really hard to ACTUALLY FOCUS on the work – because I didn’t know what “the work” should be or should look like!!! For those out there who have had a bad boss that has ended up demoralising you as a professional, or shattering your confidence, I say: YOU decide who you allow to be disappointed in you – when a bad boss tells you they’re disappointed in you, that’s THEIR expectation of you, NOT YOURS. You decide whether it’s valid, not them. Those disappointments are theirs, not yours. I am a newly elected president of an unpaid board position (at my kids preschool). Just yesterday one of the other board members said something very offensive about one of the parents of the school’s vehicle- which happened to be mine. Instead of being offended I explained to her why my childs carseat is in the front (because there are two others in the back and quite frankly the doors won’t close if there are three), and the vehicle has no airbags so it’s not a danger. My child is also large enough for a booster seat yet remains in a 5-point harness so it is just as safe as any other seat in the car. I also asked her to consider someone who only has a truck with no extended cab, and what is the expectation for their scenario. She felt very embarrassed and needless to say, so did I. Instead of being offended though, I just put it into a perspective that made her understand the situation. Right when I opened my wordpress this morning I see your post and the headline just seemed to fit. As the head of the board I feel it is my responsibility to be the leader in how to deal with difficult situations. I am also new to the school amongst veteran parents (who never stepped up to the president duties) and they are watching me very closely to see my intentions. Thanks Dan for all the inspiration to be the best leader I can be! Great action steps to change what you can and forget what you can’t.